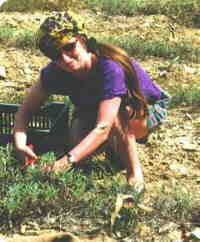 Photo left, of the author cutting sage for distillation, in the Drome Valley, France. Copyright © L. Veal. Many factors affect the constituents of essential oils. Intra-specific variation can occur within plants and trees as a result of differing soil conditions, altitude, climatic conditions and other environmental factors. In some cases, different chemotypes may occur as a result of the above factors. Distillation parameters such as the time of day and stage of growth when the plant is picked, what part(s) of the plant are distilled, the length of distillation, method of distillation, whether the plant is distilled immediately or whether it is dried first, and storage conditions if dried plant parts are used, will all affect the constituents of essential oils and hence their quality and medicinal effects. This is why it is impossible to give an exact specification for the components of an essential oil, and explains, for instance, why the eugenol content of clove bud may range from 36-95%. The classic example of an oil with different chemotypes is Thymus vulgaris, thyme oil. In this case, the plants look similar so cannot always be separated out taxonomically into subspecies, but great variations occur within the chemical constituents, and this is reflected in the aroma too. There are at least 6 chemical variations within this species, two of which contain principally a phenol, either thymol or carvacrol, while the others have an alcohol as the main component. The alcohol may be linalol (also known as linalool), geraniol, thujanol-4 or α-terpineol. Often the common names of these will be reflected by their chemotype: those with phenolic components are called red thyme, while those with alcohols are called sweet thyme. In some cases, such as pine oil, the oil is distilled from different species depending on country of origin. Thus in Scandinavia, pine oil is distilled from Pinus sylvestris, while in France Pinus palustris is often used as well. In the Alps, Siberia and the Carpathian mountains the oil is derived from Pinus cembra, but in the US the oil may be derived from Pinus caribea, P. lambertiana, P. palustris, P. taeda, P. ponderosa or P. sabiniana. In Spain, East Asia and India yet more species are used. The constituents vary to an extent within the different pine oils so that, for instance, Pinus palustris contains about 30% of the terpene β-pinene while Pinus sylvestris contains only 2%. The amount of essential oil found in the plant may also vary with the season. For instance, with the leaf oil of downy birch, Betula pubescens ssp. tortuosa, the percentage of oil found in the leaves is higher in May than at any other time. However, with most tree species the amount of essential oil found increases throughout the summer months. In drier environments, plants tend to contain less essential oil but more oxidised components. Lavender oil, Lavandula officinalis, from Bulgaria contains fewer constituents than does lavender oil from France. 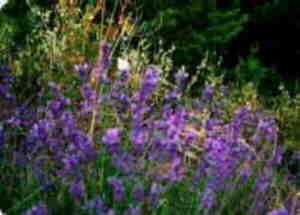 Photo left is lavender in the south of France. Copyright © L. Veal. Frankincense resin, Boswellia carterii, can originate from Eritrea, Aden or India, with widely differing chemical profiles. For instance, the α-pinene content is usually around 1% but in trees from Aden the level may be up to 43%. Sage oil, Salvia officinalis, is usually very high in the ketone thujone (also known as thuyone), but in the Drome region of France a variety low in thujone is found which makes this oil much safer in useage. 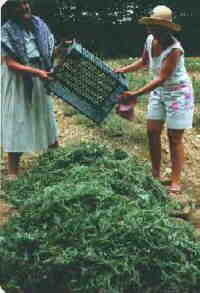 See photo (right) of sage about to be distilled in the Drome Valley. Copyright © L. Veal. Sage which is distilled after the flowers have died has a much higher ketone level than if the plant is distilled before the plant has flowered. Most of the oil in the patchouli plants, Pogostemon cablin and Pogostemon patchouli, is found in the 3 pairs of youngest leaves, while very little oil is found in the older leaves. A study of downy birch trees found that essential oil from one particular tree consistently lacked a chemical constituent that was present in neighbouring trees. Tea tree, Melaleuca alternifolia, and the Engelmann spruce, Picea engelmanni, also show a high degree of intra-specific variation. The quality and chemical components of ylang ylang, Cananga odorata, vary considerably with the time taken to distill the oil. In what is known as ylang ylang extra and ylang ylang superior, almost 35% linalool (linalol) may be present, but in the lesser grades the linalool content may be only 2%. The Extra grade also has much higher levels of benzyl acetate and p-cresyl methyl ether but lower levels of sesquiterpenes than the other oils. The total time of distillation can be up to 22 hours, but for the most therapeutic grades the distillation is only 3-4 hours. Citrus oils which are derived from the peel are often cold-expressed rather than steam distilled. However, photo-sensitive coumarins may be present in small quantities in the expressed oils which are not found in the same oils which are steam distilled. The process of cold-expression allows for the passage of larger molecules than can be obtained from steam distillation. In general, more oil is produced when dried plant material is used than if the plant is distilled fresh. There may also be a difference in constituents. For instance, lavender that is distilled from dried rather than fresh flowers tends to have a higher content of esters, of which linalyl acetate is the most important. Another aspect which can considerably change the nature and constituents of an oil is the part of the plant from which the oil is distilled. With conifer oils, the constituents will vary depending on whether the needles, twigs or bark are distilled, needle oil in general containing oxygen-containing terpene compounds - esters and terpene alcohols - alongside monoterpenes and sesquiterpenes. The oxygenated terpenenoids are much less prevalent in the volatile fractions that are derived from the oleoresins in the wood and bark. Thus if twigs are distilled along with needles, the constituents will not match the chemical profile for the needle oil of that species. Juniper, Juniperus communis, is also a conifer oil but from a different family to the pine, spruce and fir oils. Again, the composition of the oil alters if leaves and twigs are added to the still as well as berries. Juniper berry oil is reputed to be more therapeutic than the blended oil. Inki, M. and Väisänen, L. (1980) Essential oils in Betula tortuosa Ledeb. and in some other Betula species and hybrids. Reports from the Kevo Subarctic Research Station 16, 37-44. Lis-Balchin, M. (1995) Aroma science: the chemistry and bioactivity of essential oils. Amberwood Publishing. East Horsley, Surrey, UK. Kubeczka, K-H and Schultze (1987) W. Biology and chemistry of conifer oils. Flavour and Fragrance Journal 2, 137-148. Price, S. (1993) Aromatherapy workbook. Thorsons. Northampton, UK. Lowana Veal is a biologist who has carried out experimental work with essential oils. She has also written a number of articles on complementary health issues.